Winemaker’s Notes: Creamy banana and pear fruit is balanced nicely by oak and vanilla, then adds complexity with butterscotch, cinnamon-spice, butter, and tropical fruit. Pairs well with white fish, shellfish, and salad. 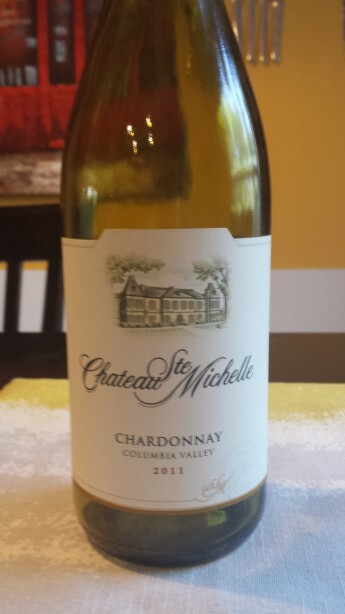 My Review: Along with the 2010 Bogle Vineyards Essential Red that I received to promote the value wines found through the Thumbs Up WineFinder, I also received a bottle of 2011 Chateau Ste Michelle Chardonnay. As you know Chardonnay is always a touchy subject in my house as my wife doesn’t like it when it’s been heavily oaked, so I’ll admit to opening this bottle for dinner with a little hesitation as I didn’t know what to expect. In the glass the wine was a light gold color and gave off aromas of banana and vanilla that spoke of the oak the wine had spent time in. In the mouth the wine surprised me by offering enough acid to balance the obvious oaking so that while there were butter and cream notes, they weren’t overwhelming and I think even my wife found the wine to be fairly enjoyable, especially when paired with a dinner of shrimp in a creamy feta sauce. This wine is by no means transcendent, but it is a good value, drinking closer to a $20 bottle than the sub-$15 you’ll find it for on the shelves. I would definitely keep this bottle in mind for casual parties as I think the flavor profile will appeal to a fairly wide range of palates and avoids being either too crisp or too buttery, allowing it to pair with a range of foods as well. A serviceable table wine that’s well-suited for those Tuesday nights when you just want something easy to pop open and sip on with dinner.